All images are © 2001 Duane Gordon and may not be reproduced without prior written permission. 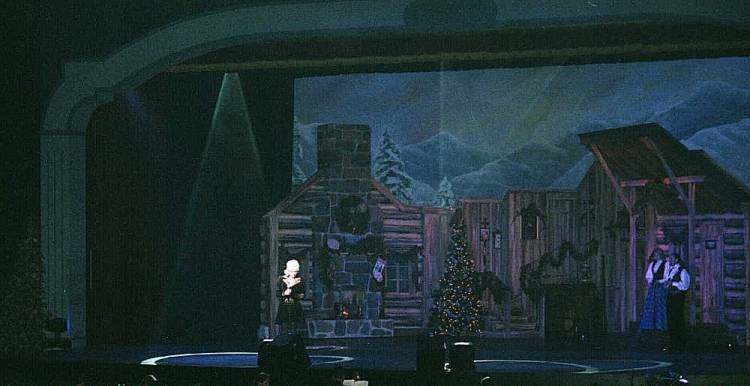 Dolly was as enchanting as ever celebrating the holidays with her annual Smoky Mountain Christmas concerts at home in Dollywood to benefit The Dollywood Foundation. She was full of spirit and joy as she pranced around the stage on the upbeat numbers, joking with the audience. 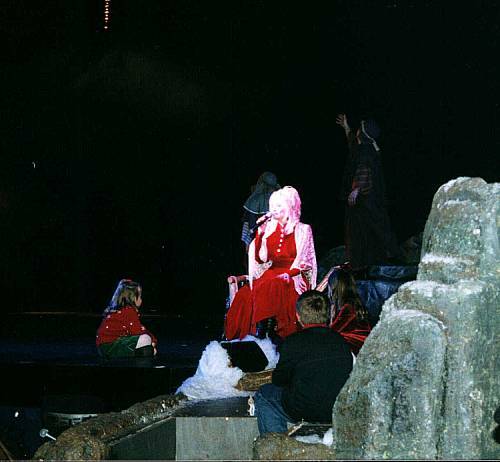 She was reverent and peaceful on the more serious songs, giving the audience a very joyful noise. The concerts raised funds for her foundation's Imagination Library program, which provides free books to pre-school children throughout the country in communities which participate. She joked that she wants to "do for books what Bob Dole has done for Viagra!" The programs' success earned her the Good Housekeeping Seal of Approval earlier this year, the first time the honor was given to a person, to which she said her husband replied that he doesn't know why they gave her the seal since she never does any (housekeeping). Between the songs she told stories, including the loneliness she felt on her first Christmas away from home after moving to Nashville in 1964 and how her family considered her brother Randy their Christmas baby, since he was born in December. (She and the cast sang "Happy Birthday" to him and her niece Heidi during Saturday night's show, which took place on their birthdays.) She said she'd never publicly told the story of how when he was a baby he was born with a hole in his heart and needed surgery. The doctors didn't know whether he'd live through the surgery, and their parents didn't know how they would pay for it either. They held a prayer service for him at church, and he was healed that night and didn't have to go through surgery. 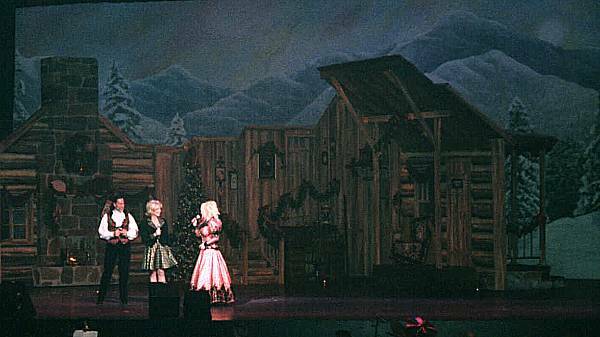 Family was a recurring theme of the evening, with Dolly performing duets with Randy and her sister Rachel singing as well. Also included were three of Dolly's nieces, Rachel's daughter, Hannah; Randy's daughter, Heidi; and Cassy's daughter, Rebecca. Dolly was surrounded by a chorus of singers and dancers, and special guests the Lee University Choir also performed. The two most moving moments of the night came when the Lee University Choir belted out a rousing and soulful "Joy To The World," and when Dolly closed the show with a new patriotic number for her encore. She wrote the song, "Color Me America," in response to the Sept. 11 terrorist attacks. Wearing a white outfit with blue stars, she brought the audience to a standing ovation. The number ended with choruses of "America The Beautiful" and "God Bless America" before Challenger, an eagle from the sanctuary at Dollywood (and the same eagle who flew over the field at the World Series game a few weeks ago in New York attended by President Bush) took flight over the audience's heads to an American flag at the back of the house. The entire show was amazing. Dolly did make a couple of mistakes (mostly when singing with Randy and other family members), but she laughed them off, and that's part of the fun unpredictability of a live show. Everyone in attendance seemed to thoroughly enjoy themselves. Thank you, Dolly! Chorus: Home For The Holidays. Picks us up and hands to us an olive branch.